Fromm Four-Star Chicken, Duck & Salmon Pâté features finely minced chicken, duck, and salmon cooked in chicken broth. The recipe is prepared in small batches, ensuring consistency, quality, and superior taste. 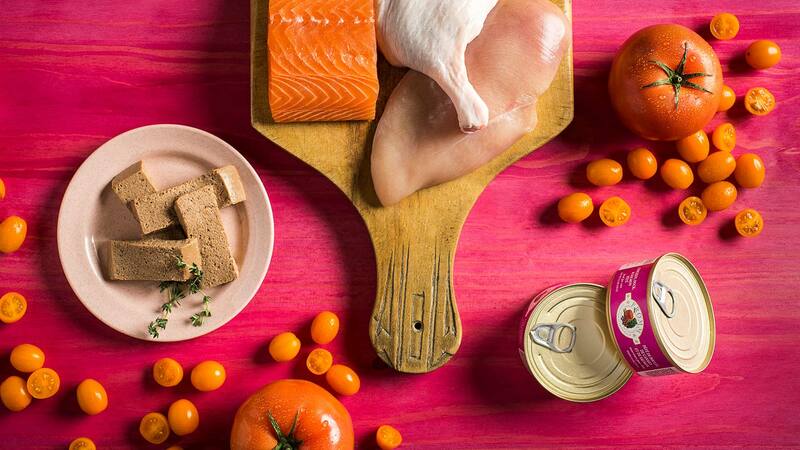 Chicken, Duck & Salmon Pâté is complete and balanced for all life stages. INGREDIENTS: Chicken, chicken broth, chicken liver, duck, salmon, flaxseed, tomato paste, salt, potassium chloride, Minerals [dicalcium phosphate, zinc sulfate, zinc proteinate, ferrous sulfate, copper sulfate, calcium iodate, copper proteinate, iron proteinate, manganese sulfate, manganese proteinate, cobalt sulfate, cobalt proteinate], xanthan gum, dried egg product, locust bean gum, taurine, Vitamins [calcium carbonate, Vitamin E supplement, niacin supplement, thiamine mononitrate, vitamin A acetate, d-calcium pantothenate, riboflavin supplement, pyridoxine hydrochloride, Vitamin B12 supplement, Vitamin D3 supplement, folic acid]. Fromm Four-Star Nutritionals® Chicken, Duck, & Salmon Pâté Food for Cats is formulated to meet the nutritional levels established by the AAFCO Cat Food Nutrient Profiles for All Life Stages.